My colleague Jo regularly reads the ZEIT. One day he came along and told me about this cooking competition. 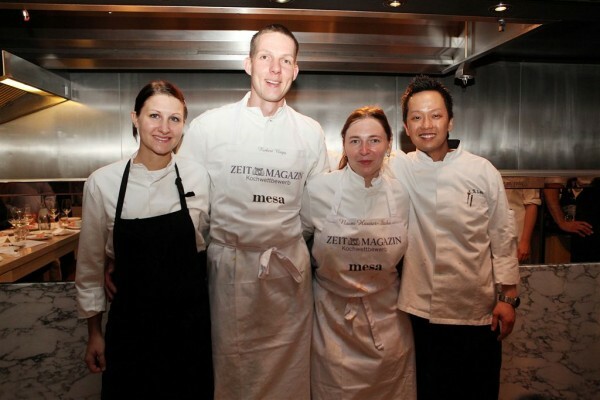 Although, the ZEIT cooking competition is being organized every year, this was the first time I became aware of it. I read the call and it sounded just perfect to me, so I decided to participate. At the end of April I submitted my meatless menu (though, fish was allowed), which I designed using one single color for each course and was made up of the green, orange and pink dishes posted previously on my blog. According to the article in the ZEITmagazin (see below for links to all articles) 150 menus have been submitted, so it was a pretty tough assignment for the aforementioned jury to select four finalists. Two separate finals were planned, one held at the Grand Hyatt in Düsseldorf and one in Berlin. Luckily, I was picked as a finalist for Berlin, where I had to prepare my meatless menu for 60 invited guests, comprising of the jury, journalists and friends of the ZEIT. Maybe I was picked intentionally for Berlin, because Josef Eder, the executive chef of the Grand Hyatt Berlin was obviously pretty convinced of my menu proposal. I was allowed to bring a friend to help me preparing and serving the menu. I asked Noémi, author of the Almond Corner blog if she wanted to join me for this challenge, because we both think similarly about cooking. She was very pleased and said yes, so we went together to Berlin. The organizers of the ZEIT awaited us for 12am at the lobby of the hotel, along with my very kind and pretty comrade-in-arms Lena, who brought her mother Dani as help. Everybody was very nice and cheerful. We had a pleasant chat, then went to the mesa Restaurant for a light lunch, where we sampled all the dishes on the menu. Mesa is one of the three restaurants at the Grand Hyatt Berlin. The menu consists of traditional German dishes (such as currywurst, spätzle, sausage salad), which are served in small bowls or glasses resembling a kind of German tapas. The executive chef of the hotel, Josef Eder joined us later, because he had to cook lunch some hundred meters away for Angela Merkel, the German chancellor. I really enjoyed his humorous and slightly ironic style. He put our minds at rest by telling us that based on our submitted recipes a lot of components for our menus have already been prepared by the kitchen staff based. Only very few tasks were left to us like slicing the zucchini or marinating the carrot cubes. Before getting to work we enjoyed an entertaining tour through the hotel guided by Mr. Eder, where we also visited all three restaurants of the hotel. About 60 cooks are working in the huge kitchens of the hotel, which are partly separated. E.g. to get from the mesa restaurant to the patisserie you have to use two different elevators and walk approx. 300 meters through maze-like corridors and hallways. The mesa has an open kitchen from where you have a nice view over the guests. It’s also equipped with two huge marble desks located in the middle of the dining room. These were the marble slabs where Lena and I were plating our dishes during the evening – directly in front of the invited guests. After each course we moved back to the kitchen so we could not hear the comments of the jury and see the voting of the guests. Afterwards the winner for the current course was announced based on the votes of the 60 guests. The final winner of the contest was determined by the overall votes. Though, I received a lot of positive responses, unfortunately I didn’t win the contest. It was a great experience and I learned a lot during the day. It’s not an easy task to cook and plate for 60 people. Indeed, it’s pretty hard, especially if you want to serve slightly complex dishes. All guests were served both dishes at each course simultaneously. While Lena’s courses (see Lena’s menu) required 3 to 4 moves for each plate, I had 7 to 9 because of all the different elements in my dishes. They could have been served without any problems for a table of four, but for 60 people I would have had to practice an plan a lot more beforehand. Actually, there was a practice session planned for the afternoon, but unfortunately it was first postponed, then cancelled. Though, pre-plating my appetizer would have been crucial, because sadly the dish lacked flavor – which could have been corrected before service. Instead, all my starters went out blind. I lost this course and because all votes counted, I already lost the chance to win the final right with the first course. 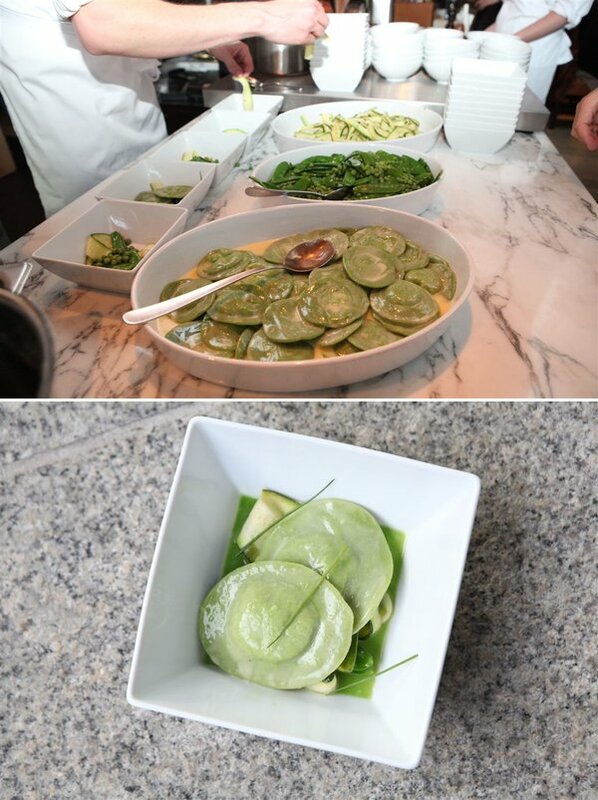 After the dinner I asked some of the guests about the appetizer, they said the ravioli was too thick (well, they were done already when I arrived) and some didn’t like peas. I wasn’t aware of this fact before, so a lot of people were shocked by the clean pea taste (though, some guests really liked it). It’s a little bit annoying still, because I could have easily corrected the seasoning in the first course. My main course was made up of many components too, but by now me and my team warmed up and everything went along pretty smooth. It was a little bit like me playing tennis, where I usually need half an hour to warm up and by that time the first set was usually already lost. I would like to thank the kitchen for the great fish they managed to get, it was beautiful sushi quality rainbow trout. The puree was also very smooth and silky and had a clear carrot taste. The gingery carrot foam and the marinated carrot cubes were perfect too. The guests were allowed to repeat orders if they liked a dish – and for the main course we got a lot of repeat orders. At the end, we managed to win the battle for the main course. This was the only dish of my menu I managed to plate and serve the same way I planned and created it at home – everything was perfect or even better. 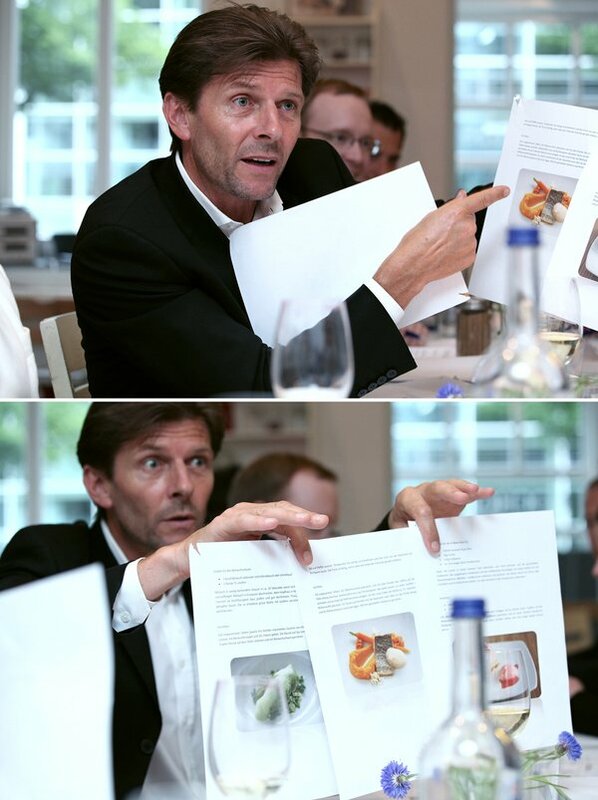 By the way: my main course was the only contest plate of which a photo appeared later on the Facebook page of the ZEIT. The dessert was already finished completely when we arrived at the patisserie during the inspection in the afternoon, so I had no chance to fix anything. Both the cake and the sorbet were slightly too sweet and lost their refreshing character. Also far too less goji berries were used in the sponge base of the cake. After the dinner, while talking to guests everybody asked me where the Goji berries were hidden. 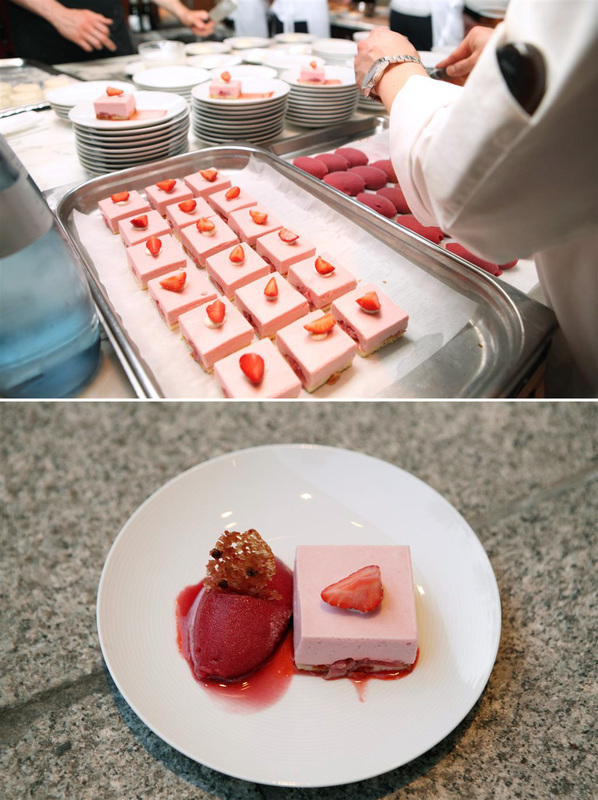 Form, color and consistency were great and the strawberries were of good quality too. Afterwards I was told that the jury favored my dessert, so there was hope that I might turn the tables, but unfortunately the guests voted for the other dessert. 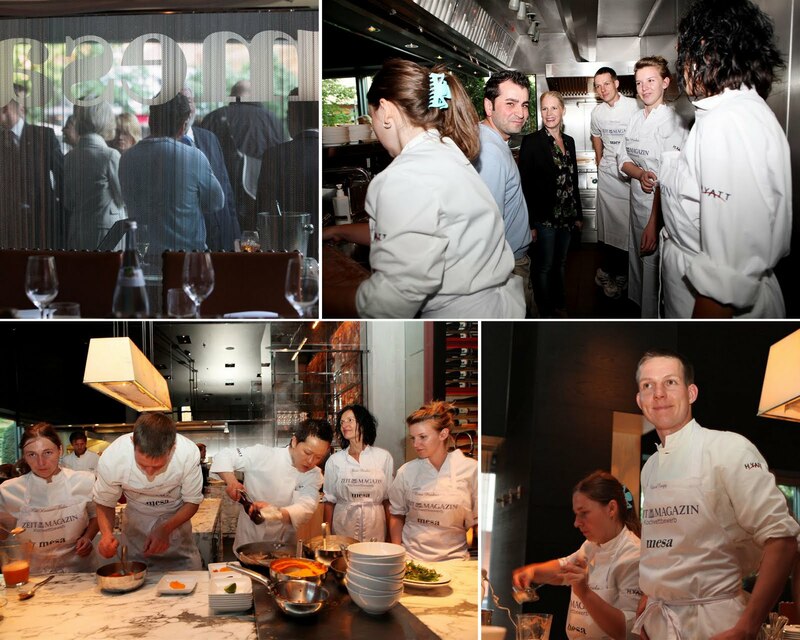 I highly recommend to anyone who loves to cook to participate at the ZEIT cooking competition. Don’t panic, there is plenty of help around you and you’ll be done with all preparations when the guests arrive. Everybody – both from the hotel and from the ZEIT – was very very nice and friendly, and the whole day was a lot of fun. I’ve also learnt many lessons for the next year. Because the 60 invited journalists and friends of the ZEIT are determining who’s going to win the first prize and not the jury on its own as in previous years, I would recommend to prepare rather simple, easily understandable dishes with one definite twist. Probably, thinking in bistro dishes would be a good concept for next year. When I asked the guests about my menu, I noted that some didn’t recognize the mint in the appetizer, some couldn’t tell that there was ginger in the main course and again some didn’t taste the pink pepper in the dessert. Although, there were guests also who enjoyed exactly these fine nuances. Though I was praised for my precise recipes, some instructions are really hard to formulate as text descriptions. For example, I usually write in my recipes to adjust something to taste with salt or in desserts with lemon juice and icing sugar. This of course leaves a lot of freedom and with a too sweet dessert the freshness gets lost. So from now on when writing recipes I’ll concentrate more on the small details that make a difference, e.g. explaining why something has to be done the way it is described and how the result should taste and how its consistency should be afterwards. By the way, this is exactly the information most cookbooks lack of and I believe this significant gap is also responsible why the same recipe prepared by different people (in different kitchens) leads to various results. A quote from Tim Mälzer describes this perfectly, he said once that you should give ten cooks the task to boil water and you’ll get ten different results. Furthermore, each component has to be tasted separately and as part of a test serving too. This is such a simple advice, but you learn this only when you make the mistake yourself. So whatever the time limits are, it’s crucial to plate and try each dish at least once before the guests arrive. I committed both mistakes, there was no test plate and all appetizers went out practically blind. During recipe creation fast and simple plating (3-4 moves per plate at most) and adaptability to different dishware should be considered too. At mesa the dishes had to be served on small plates, which is not so simple if you have a lot of elements. 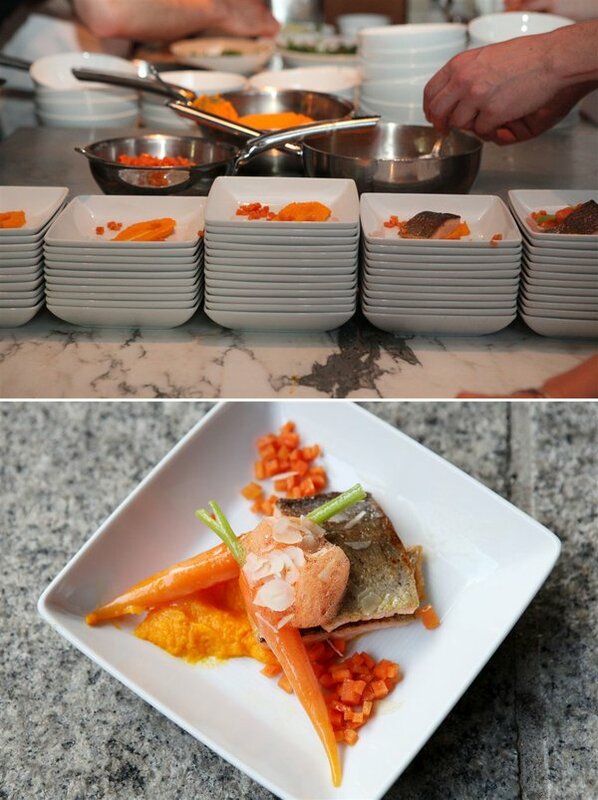 Also too many elements require a lot of moves while plating the dishes, so it slows down the serving significantly. Maybe pre-building some parts would be a nice solution, but this still has to be considered during recipe design. Finally, congratulations to Lena, the winner of the final in Berlin. I really enjoyed her company throughout the day and it was great that we didn’t see each other as enemies but rather as comrade-in-arms. I’d like to thank Noémi, who – without any further instructions – always knew what to do, how and why. I couldn’t have asked anyone better. 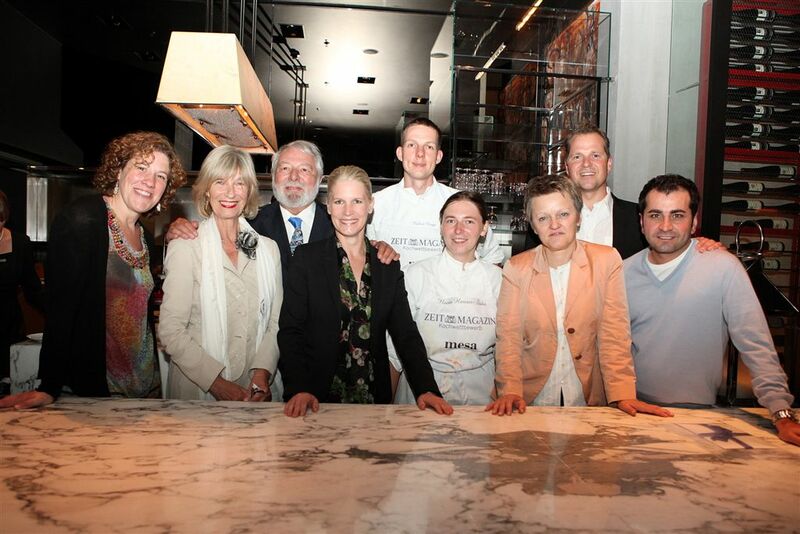 Many thanks to the staff of the Grand Hyatt Berlin and the mesa team. Special thanks to Pia and Song, I could not have dreamt of a better team. Thanks to Ákos and Angéla for the tips regarding my tuile questions. And last but not least, thanks to everybody who crossed their fingers for me. Kochen Sie mit uns – fleischlos! Sie kochen – wir essen!